In the project described above, the NPV decreased as the discount rate was increased. Is this always the case? 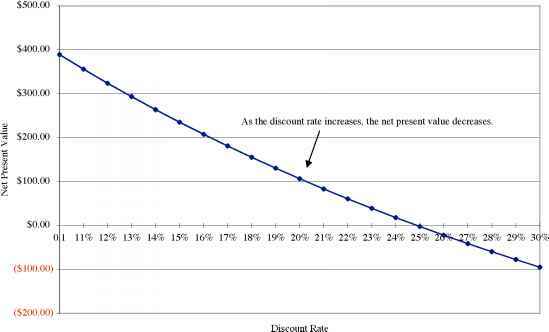 If no, when might the NPV go up as the discount rate is increased? 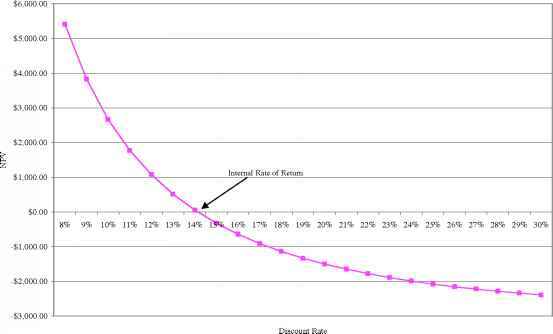 One advantage of the internal rate of return is that it can be used even in cases where the discount rate is unknown. While this is true for the calculation of the IRR, it is not true when the decision maker has to use the IRR to decide whether to take a project or not. At that stage in the process, the internal rate of return has to be compared to the discount rate - if the IRR is greater than the discount rate, the project is a good one; alternatively, the project should be rejected. • The IRR can be calculated based upon the free cash flows to the firm and the total investment in the project. In doing so, the IRR has to be compared to the cost of capital. 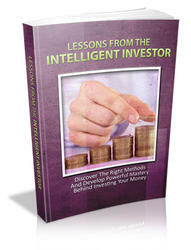 • The IRR can be calculated based upon the free cash flows to equity and the equity investment in the project. If it is estimated with these cash flows, it has to be compared to the cost of equity, which should reflect the riskiness of the project. The cash flows to the firm from the proposed theme park in Thailand, are used to arrive at a NPV profile for the project in Figure 5.5. The net present value profile depicted in Figure 5.6 is based upon the equity investment and the free cash flows to equity estimated for the paper plant for Aracruz. The internal rate of return (in real terms) on this project is 18.06%, which is higher than the real cost of equity of 11.40%. Again, these results are consistent with the findings from the NPV rule, which also recommended accepting this investment. The internal rate of return is the most widely used discounted cash flow rule in investment analysis, but it does have some serious limitations. 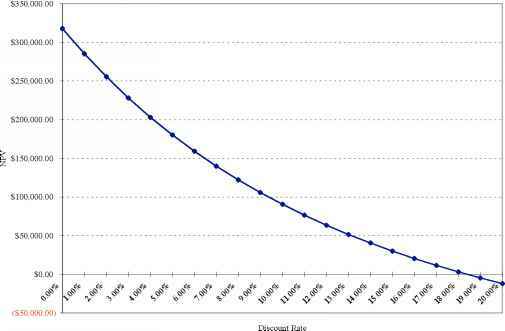 11 The terminal value of the project itself is a function of the discount rate used. That is why the IRR function in excel will not yield the right answer. Instead, the net present value has to be recomputed at every discount rate and the IRR is the point at which the NPV=0. • Since the IRR is a scaled measure, it tends to bias decision makers towards smaller projects, which are much more likely to yield high percentage returns, over larger ones. 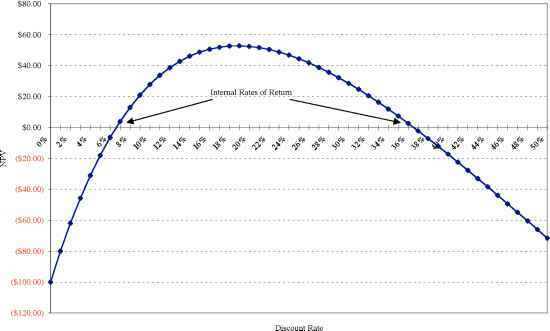 • There are a number of scenarios where the internal rate of return cannot be computed or is not meaningful as a decision tool. The first is when there is no or only a very small initial investment and the investment is spread over time. In such cases, the IRR cannot be computed, or, if computed, is likely to be meaningless. The second is when there is more than one internal rate of return for a project, and it is not clear which one the decision maker should use. The net present value profile for this project, shown in figure 5.8, reflects the problems that arise with the IRR measure. As you can see, this project has two internal rates of return - 6.60% and 36.55%. Since the hurdle rate falls between these two IRRs, the decision on whether to take the project or not will change depending upon which IRR is used. In order to make the right decision in this case, the decision maker would have to look at the NPV profile. If, as in this case, the net present value is positive at the hurdle rate, the project should be accepted. If the net present value is negative at the hurdle rate, the project should be rejected. Multiple IRRs: Why They Exist And What To Do About Them. 12 While the number of internal rates of return will be equal to the number of sign changes, some internal rates of return may be so far out of the realm of the ordinary (eg. 10,000%) that they may not create the kinds of problems described here. 5.6, for example, the cash flow changes sign from negative to positive in year 1, and from positive to negative in year 4, leading to internal rates of return. Lest this be viewed as some strange artifact that is unlikely to happen in the real world, note that many long term projects require substantial reinvestment at intermediate points in the project and that these reinvestments may cause the cash flows in those years to become negative. When this happens, the IRR approach may run into trouble. There are a number of solutions suggested to the multiple IRR problems. One is to use the hurdle rate to bring the negative cash flows from intermediate periods back to the present. Another is to construct a NPV profile. In either case, it is probably much simpler to estimate and use the net present value.